When I think of troubled kids — drop-outs, drugs, and delinquency — who’ve made good, I invariably think of certain celebrity chefs who also happen to write beautifully. Tony Bourdain of the TV shows No Reservations and The Layover. His first book No Reservations was supposed to be his fifteen minutes of fame. Fifteen minutes isn’t enough though because he’s that perfect balance of funny, snarky and soft-hearted. Gabrielle Hamilton, chef owner of Prune, also comes to mind. Her poignant memoir, Blood, Bones and Butter: The Inadvertent Education of a Reluctant Chef, chronicles her improbable climb from waitress and drug dealer to chef and author. My latest discovery via my husband is bad boy Eddie Huang of Bao House. His memoir is a laugh-out-loud kind of book but you might have to be Asian to revel in the uncomfortable and meant-t0-be-secret Tiger Parenting antics that we’ve all endured. 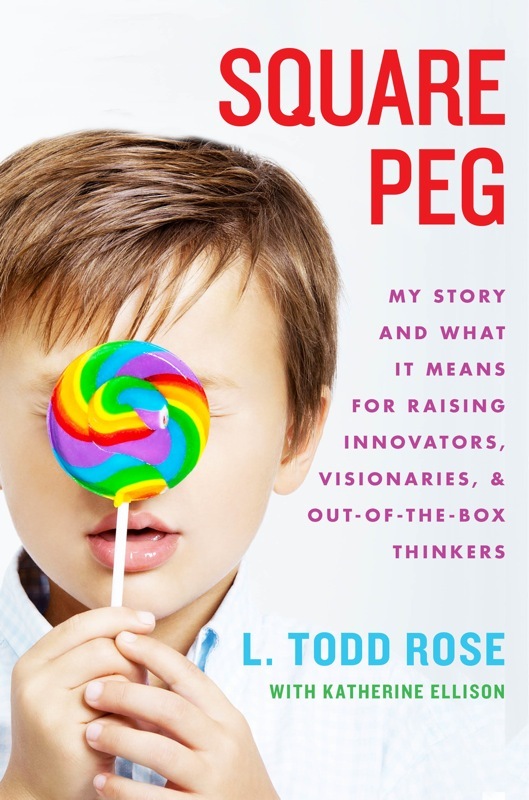 L. Todd Rose’s book, Square Pegs, is a book — part memoir, and part parenting book — that the chefs’ parents might have benefited from. Rose challenges us to rethink education constructs. Square pegs, he argues, are also innovators and visionaries. They are exactly what the U.S. economy needs to compete in the new global economy. As a professional educator, L. Todd’s Square Pegs, brings insight into our U.S. education system with its roots in a “factory” model that discourages divergent thinking. With ADD and ADHD children now numbering more than 5.2 million in the United States alone and 12.% of boys between the ages of 3-17* diagnosed with ADHD, new insights into an education process that works are definitely needed! Even more so, this is L. Todd Rose’s personal story of failing in our American public school system. Undiagnosed with ADHD until middle school, L. Todd resisted medication, rebelling until he hit rock bottom: a high school drop out, married to his pregnant high school sweetheart making minimum wage. The underlying root cause — the very way he thinks and learns — ultimately propels him to success. From high school delinquent and dropout to Harvard faculty, his story illustrates the power of “context”, mentors, and harnessing the gifts that ADHD brings. In contrast to Square Pegs’ perspective on education, Sir. Ken Robinson argues, in his animated TEDTalk (yes, not animated as in exciting, but with actual drawings that move), that our education paradigm is vastly outdated for this new economy. While he seems to agree with L. Todd Rose on some points, his take on ADHD might be seen as shockingly controversial. The loss of the arts is precisely where education ought to be focusing on, he argues, and he goes on to hypothesize that ADHD is a fictitious epidemic resulting from the emphasis on standardized tests. He notes data that shows the prevalence of ADHD is a U.S. geographic phenomenon, increasing in numbers the further east you go. No matter what your take on ADHD or the state of the U.S. Public Education system, Rose and Robinson both encourage us to shake things up. Look at our world differently. Maybe there hope that we can all be Square Peg-like in this round world of ours! What do you think? I’d love to hear your thoughts. Their views on ADHD are especially out-of-the-box. Here’s an infographic for more background on ADHD and ADD. I am part of a blog tour for Square Pegs and received a copy for review. My opinions are my own including my belief that no one wants to be labeled a round peg either. Like we all want to cop to being boring, rule followers? Maybe it’s labels that are the enemy. Also of interest, research indicating that female teachers expect more female, i.e pleaser, compliant, quiet classroom behavior than male teachers. Dearth of male teachers in primary Ed exacerbates this bias. I agree totally with Sir Ken Robinson. What I did find shocking was the geographic distribution of ADHD. Our schools are still stuck in the factory model. All the talk about different styles of learning does not change that. Unfortunately, things don’t seem to be changing. Teachers are forced to teach to the test so that children can find that one answer. They have become machines forced to spend most of the time in the classroom evaluating instead of teaching. Parents share some of the blame when they compete to send their children to the “best” schools where they will be able to get the highest scores on the entrance tests to college and then, of course, they will get into the “best” colleges. The real question is will they gain useful knowledge for living a happy life. Many of them don’t even get the jobs and success that they thought would be guaranteed. Sir Ken Robinson is also correct about the overuse of medication for ADHD children. I have seen children falling in sleep in class because they were overmedicated. Perhaps this is setting a precedent for the tendency in the US to take a pill for any every minor discomfit a person feels! Sir Ken Robinson’s TEDTalk was illuminating as well as fun to watch. I also found that geographic distribution of ADHD to be telling. The thing is — I live in MA — the higher the ADHD incidences, the higher the standardized test scores too (I believe). You are right that getting into the “best” schools is much more meaningless than decades ago. I think it’s more important to let kids discover their passion and find a career from that. I do not like labels – they are far too general to be completely true for anyone, and they can be highly limiting as well. As you point out, being a square peg in a round world may be tough, but being seen as a round peg is not exactly fun. Maybe they should do away with square versus round peg labels altogether. There are so many other shapes out there, right? Triangles, rectangles, trapezoids, ovals, parallelograms etc. Maybe we are all of these shapes! Two choices is just too limiting! I totally agree with you! Squares and circles are not enough shapes to describe kids and their learning styles! Haven’t watched the video yet but I will (even though I find watching online videos a form of torture for me, the inimitable scanner – I just don’t have the patience!). I HAVE added Square Pegs to my Amazon Shopping Cart (which I will buy as soon as our bank balance lets me). Katherine Ellison is the co-author and she is AWESOME. Her book Buzz was wonderful. Thanks, Mia! You know how much this touches me!! Don’t order it. I will send you my copy as soon as it comes back from a friend. It’s a loaner kind of book to pay it forward. I just need your mailing address again: pragmaticmomblog@gmail.com . Might be a few weeks when my friend finishes it though. Creating this kind of awareness is just what the society needs. I personally did not know that ADHD affects so many kids. I am have seen certain behaviors that you have mentioned here in my son. I think I will have him checked by a specialist. Thanks for letting us know. Great post with some really important ideas. It’s clearly time that we rethink our educational models, and question why so many of our students are unsuccessful–and labeled–as if that excuses their dis-engagement with school. I also love how you cited the numerous books by chefs that also address this topic. I’ve heard great things about a number of them, but haven’t gotten a chance to read them. Your post reminded me to put them on my TBR list! In some ways, it seems the professional kitchen is a safe haven for people who need a more unconventional arena to succeed. It’s too bad that schools can’t provide that as well but there is such emphasis on rules and following rules that it seems to turn off kids who need more freedom to succeed. And yet, given freedom and a rallying cry of sink or swim, these chefs have, against all odds, done well as well as overcome demons like drug addiction. I think I read that 90% of restaurants fail in their first year. These guys have succeeded through sheer will by creating a restaurant culture that is obsessively focused on a quality experience as well as shown the ability to take lessons from failure to improve. It’s fun to root for the underdog! I like this idea that it might be a created condition caused by our standardized education system. I also love that they become innovators! I think the root cause of the geographic trend of ADHD diagnosis is worth exploring more deeply by the Pediatric and education community. It’s kind of disturbing if this is a result of the emphasis on standardized tests so I’d run that data alongside too. Perhaps this is another disastrous outcome of Bush’s legacy! My son has ADHD. I also have ADD. Because of this I have been forced to learn a lot about the subject. What many fail to understand is that it is a right-brained and left-brained issue. All children with ADD or ADHD are rightbrained thinkers. This will not work. A fantastic book that explains this is: Right-Brained Children in a Left-Brained World by Jeffrey Freed M.A.T. and Laurie Parsons. Thank you so much for sharing that great resource! Thanks for sharing your thoughts on SQUARE PEG for the book tour! Thanks Heather! Great book. I am loaning it to a friend who has an ADHD child and then will send it to another friend when it comes back. It’s very helpful especially if you are not medicating. I teach college students with dyslexia. This book is just awesome too bad I didn’t manage to go through all of it coz i had borrowed it from a student who left abruptly. This book is great if you are teaching or parenting ADHD kids. Great infographic. Thanks! Is there any difference between boys and girls if we are talking about ADHD?